We are dependable Manufacturer, Supplier and Exporter of Electroperm Magnetic Round Chuck for Turning UL-821, to a broad clientele of national and international stature. The Circular Electroperm Magnetic Round Chuck for Turning UL-821, provided by us, acts as a cost-efficient holding device for surface grinding and other types of grinding mechanisms. 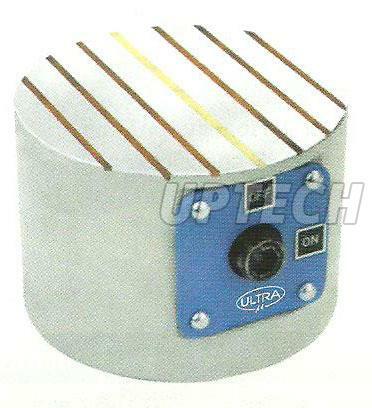 The Circular Electro permanent Magnetic Turning UL is available at low price. Cold device as it doesn't require power continuously except for short period of activation and deactivation. Parallelism and flatness is 0.010mm/ 300mm. Economical for operation and maintenance. Uniform clamping force all over surface. Slippering force is 2.5 kg/cm2. Vertical Lifting Force is 35 -40 kg/cm2. Variable supply unit to vary power which helps in alignment and removing of warpages of thin jobs.